MOSCOW, October 9. /TASS/. Russia’s Federal Service for Military and Technical Cooperation reported on October 9, 2017 that Moscow and Riyadh had reached an agreement on the delivery of S-400 air defense missile systems and other armaments to Saudi Arabia. The S-400 Triumf (NATO reporting name: SA-21 Growler) is a Russian long-and medium-range air defense missile system. It is designed to destroy air attack and reconnaissance means (including stealth aircraft) and any other aerial targets amid intensive counter-fire and jamming. The work on the conceptual design of the point air defense missile system initially designated as the S-300PM3 was launched by the Almaz research and production association (currently the Almaz research and production association named after Academician Alexander Raspletin, Moscow) in the mid-1980s under the supervision of Chief Designer Alexander Lemansky. This work was intensified in the late 1990s and on February 12, 1999 the system was demonstrated for the first time at the Kapustin Yar practice range (the Astrakhan Region) to then-Defense Minister Igor Sergeyev. The trials of the most advanced air defense missile system were carried out in the 2000s. On April 28, 2007, the S-400 went into service and the first battalion of the newest surface-to-air missile systems assumed combat duty on August 6 that year in the town of Elektrostal (the Moscow Region). Six weeks later, On September 27, 2007, the Triumf’s developer, Alexander Lemansky who saw the launch of his missile system into serial production, died at the Kapustin Yar practice range. The system’s first live-fire exercises were successfully carried out at the Kapustin Yar practice range in 2011. The S-400 is based on the S-300PMU2 air defense missile complex. It differs from its predecessors by its extended combat range and the capability of using new surface-to-air missile systems. It is capable of detecting and destroying low-observable (stealth) and fast-moving aerial targets. The S-400 system can also additionally include an all-altitude radar (detector) and movable towers for an antenna post. All the S-400’s means are mounted on the wheeled all-terrain chassis (produced by the Minsk Wheeled Tractor Factory and the Bryansk Automobile Enterprise) and can be transported by rail, water and air transport. The S-400 can selectively operate with the use of no less than 5 missile types of various takeoff weights and launch ranges to create a layered air defense zone. 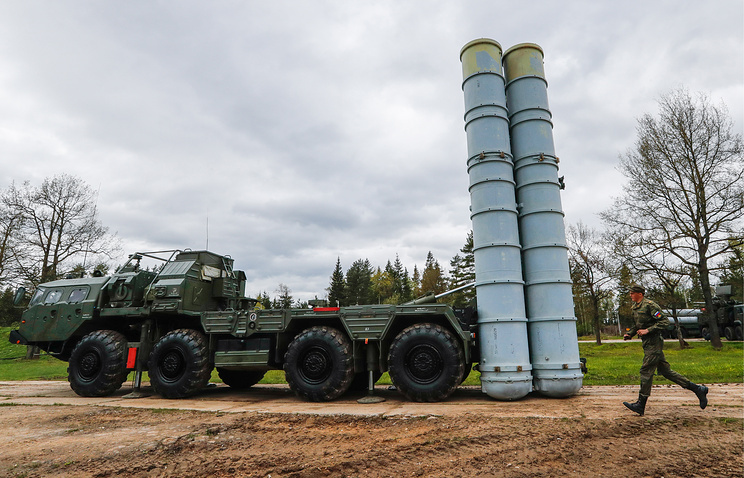 The S-400 is also capable of exercising control of other air defense missile systems (the Tor-M1, the Pantsyr-S1), providing highly effective air defense even amid a mass air attack with the use of electronic warfare means. Russian Aerospace Force Deputy Commander-in-Chief Viktor Gumyonny said on April 8, 2017 that missiles capable of "destroying targets in outer space, at long distances and large speeds" had started arriving for S-400 systems. According to public sources, 19 regiments armed with S-400 complexes were on combat duty in the Russian Armed Forces as of April 2017. Overall, these regiments included a total of 38 battalions and 304 launchers in Elektrostal, Dmitrov, Zvenigorod, Kurilovo (Moscow Region), Nakhodka (the Primorye Territory), Kaliningrad, Novorossiysk (the Krasnodar Territory), Polyarny (the Murmansk Region), Petropavlovsk-Kamchatsky (the Kamchatka Territory), Novosibirsk, Vladivostok, Sevastopol and other places. The state armament program envisages the arrival of 56 S-400 battalions for troops by 2020, which will make it possible to rearm 28 two-battalion air defense missile regiments. A battalion of Triumf surface-to-air missile systems was deployed on November 25, 2015 from the Moscow Region to Syria’s Hmeymim air base accommodating the Russian air task force. Later on, according to media reports, another S-400 battalion was deployed in the Syrian province of Hama.